While Wes Smith was scoring 27 points on the offensive end of the floor, the Wabash defense combined to hold Allegheny to 37-percent shooting in a 73-56 win by the Little Giants. The victory puts Wabash in the North Coast Athletic Conference Men’s Basketball championship game for the second consecutive season. The Little Giants held George Raftis, Allegheny’s top scorer coming at 15.4 points a contest coming into the conference semifinal matchup, under wraps all game long. Senior Brian Maloney drew most of the defensive assignment to shut down Raftis, holding him to nine points and nine total shots. Wabash outscored the Gators 39-25 in the final period. 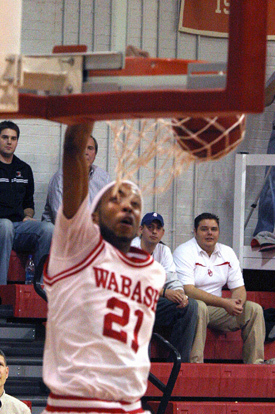 Wabash led from the start, scoring the first nine points of the game on three-pointers by Smith and Ben Burkett. Smith was responsible for eight of the first 14 points for the Little Giants. Despite the early success, Allegheny hung with Wabash, tying the score twice before a 16-4 put the Little Giants up 12 with 3:43 left in the first period. Allegheny rallied in the closing minutes of the first half, holding the Little Giants without a basket over the final 1:34 of the contest. The Gators trimmed the lead to five points when Craig Devinney lofted a turn-around jumper ahead of the halftime buzzer that fell through the basket to cut the lead to 34-31 at the break. The Little Giants refused to allow Allegheny to take momentum into the second half. Smith scored three straight baskets and Andrew Gilman added two free throws to begin the final period. Chase Haltom added a three-pointer at the 14:03 mark to push the lead to 13 points. The lead expanded thanks to a Wabash defense that held Allegheny scoreless from the field for the first six minutes of the half before Devinney final broke through with a basket at 13:47. Wabash only surrendered nine baskets in the final period while hitting 13-of-22 attempts, including 6-of-8 from three-point range to cruise to the victory. Smith was 11-of-17 from the field in the contest, recording his fourth double-double of the season by adding a game-high 14 rebounds. He also made four steals to take over sixth place on the career steals list for the Little Giants. Haltom added 11 points with three treys and two free throws. Derek Bailey tossed in eight points coming off the bench. Henry Heeter led Allegheny (12-15) with 17 points. Devinney scored 12. Wabash (14-12) will play top-seeded Wooster (21-6) in Saturday night’s championship game at Timken Gymnasium in Wooster, Ohio. The Fighting Scots defeated Kenyon College 89-71 in the second semifinal contest Friday night. Ian Franks was one of five Wooster players reaching double figures in scoring. Franks had 17 to pace the Scots. Tipoff Saturday night is set for 7 p.m. Photos - (top left) Sophomore Wes Smith scored a game-high 27 points and grabbed 14 rebounds to put Wabash in Saturday night's NCAC Championship game against Wooster. 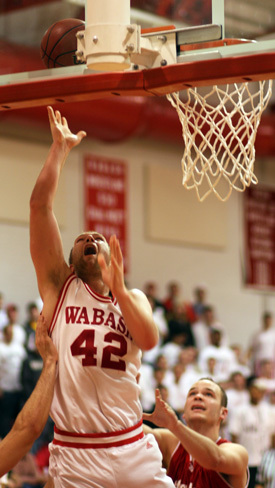 (Bottom right) Brian Maloney scored six points and kept Allegheny postman George Raftis to nine points in Wabash's win over the Gators.